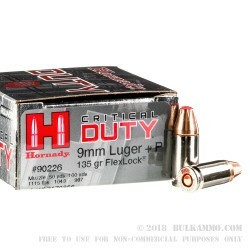 Hornady Critical Duty 9x19 rounds have been serving the law enforcement community and civilian concealed carry community for many years now and have built a reputation for quality. Their reliable performance has cemented their reputation as a go-to load for self-defense. 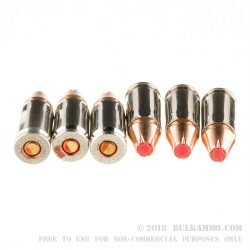 Many Hornady rounds also have that signature red polymer tip that provides a better ballistic coefficient, keeps the hollow point bullets from getting debris in them upon impact, and helps the bullet completely expand when striking a target. The Critical Duty line has been tested to current FBI standards, including the barrier tests, and passed them without any problems. These rounds are loaded with 135 grain Flex Lock hollow point bullets and feature a +P or 'Over Pressure' powder loading for maximum impact, penetration, and terminal ballistic effect. 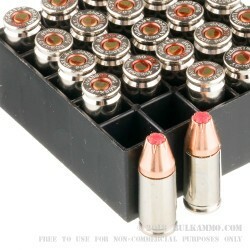 The bullets are loaded into new, reloadable, nickel-plated, heavy walled, non-corrosive Boxer primed brass cases. 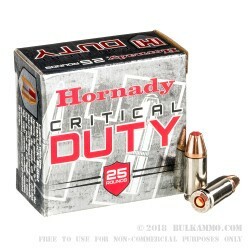 Unlike most other 9mm defensive ammo brands, the Hornady Critical Duty line comes in a box of 25 cartridges and is available in larger quantities if needed. These are perfect for your next CCW class, any handgun or pistol caliber carbine class, or any family excursion that you want to take. A couple of the standard box of 25 rounds gives you more ammo to allow you to truly test out that new handgun and decide these defensive handgun loads are right for you. Pack these into your armory today.